SaD also includes a Zombie Recovery mode. A Zombie is an image file that exists in your library, but is no longer being tracked or displayed in iPhoto. In recovery mode these image files are identified and re-added to the iPhoto database. iPhoto wants to be the only manager of your library images. However sometimes bad things happen to good people and a library image is deleted without iPhoto being aware of the operation. This will lead to problems down the road. ☂ triangle with exclamation icon when trying to view the image. ☂ Broken Albums, Books, and slideshows. Within iPhoto select the images you want to have SaD scan. SaD will check these images to make sure they are still accessible. If it finds any that are not, they will be tagged with a keyword (or optionally moved to the trash folder). Once complete, you will use iPhoto's search capabilities to find these tagged images and delete them manually. ☹ You may have used some file cleaning tool that automatically searches your filesystem to remove duplicates. If the tool was not specifically designed for iPhoto, then there is no way for iPhoto to know what happened. ☹ You were somehow misguided into opening up the iPhoto library package in finder, or terminal, and deleted image files manually. ☹ You have externally referenced files in your iPhoto library and the image files were deleted or moved. Sometimes emptying iPhoto's trash fails to properly remove the image files from its library. These images are still there, but iPhoto can no longer track or view them. They have become Zombies. Over time, these Zombies can consume a large amount of disk space which is indeed wasted space. There is no clear reason why iPhoto leaves these Zombies behind. There may also be other causes similar to the causes enumerated above for missing files. SaD in Zombie Recovery Mode will detect these Zombies and force iPhoto to see them again. These images are placed in the "SaD Zombies" album. You can then review the Zombies and determine which you no longer need, and those which are essential to keep. Zombie detection requires a full library scan and is not performed when processing a selection of images. SaD For iPhoto is free to download and use. We do, however, appreciate gratuities if you've found it valuable and useful. Visit the SaD For iPhoto Support Page. 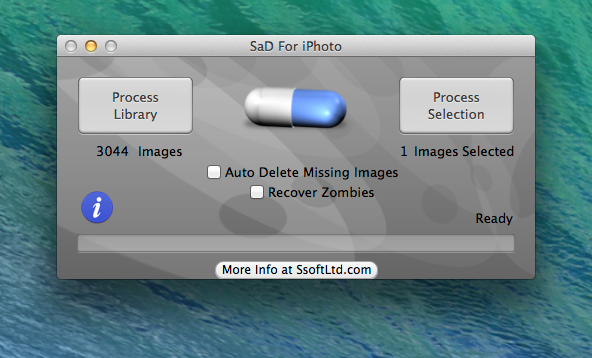 V1.4.4 Introduces the "SaD Master Missing" keyword which is applied to images that are missing their master image file. Typically this happens when a RAW image file has been deleted from the iPhoto library without iPhoto's knowledge. In normal operation iPhoto tends not to complain about this situation and it may take a long time before a user even that the master is missing. Image tagged with "SaD Master Missing" are never auto-trashed as iPhoto is usually happy enough to work with the automatically generated jpeg versions of master RAW images. V1.4.3 Simplified Donation Procedure. This version *might* work with OS X 10.6. If you are using 10.6 please drop us an email as we are unable to test the compatibility. V1.4.2 Prevents machine from sleeping while a scan is in progress an other minor improvements. Mavericks and iPhoto 9.5 tested. V1.4.0 Adds a zombie recovery mode. A zombie is a image file that exists in your library, but is no longer being tracked or displayed in iPhoto. In zombie recovery mode, these image files are identified and re-added to the iPhoto database. Bug fixes. V1.3.1 New, simpler, UI. Bug fixes. V1.2.1 Keywords are now automatically generated. You no longer have to enter them manually. V1.1 Add the ability to scan your entire library with a single click. No need to make a selection in iPhoto.